CHAPLET OF THE UNBORN (with SPANISH prayer card). The CHAPLET OF THE UNBORN was given to us by Our Lady for all to unite in prayer to bring an end to abortion. "I have come with yet another important weapon in the fight against abortion. As you know, abortion is the one crime which, if conquered, would change the future of the world. The weapon I now hand off to you is the Chaplet of the Unborn." 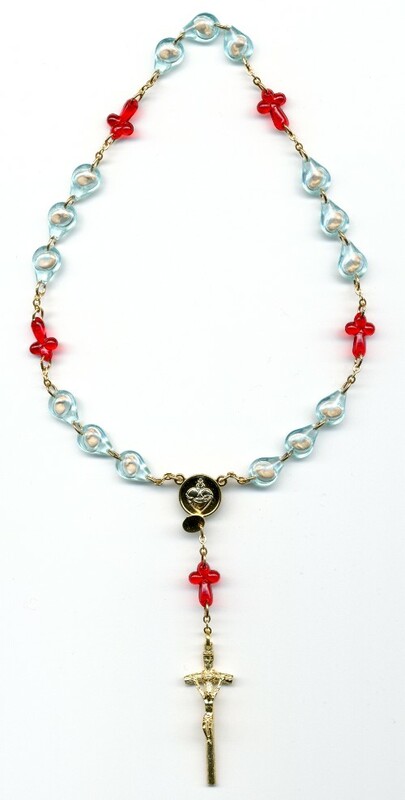 Designed similar to Our Lady's Rosary of the Unborn, The Chaplet of the Unborn features 5 sets of One 'Our Father' and 3 'Hail Mary' beads, each prayed for a certain intention that will strengthened prayer efforts to end abortion. 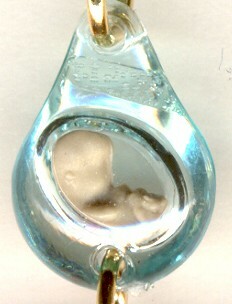 The light blue, teardrop-shaped beads hold an image of an unborn baby, while the dark red 'Our Father' beads are in the shape of a cross. The centerpiece holds the image of the United Hearts of Jesus and Mary and a Papal Crucifix begins the Chaplet. Blessed Mother January 29, 2014 says: "Praise be to Jesus. Dear children, My Chaplet of the Unborn is important as it points out the error of abortion, the importance of life in the womb, and petitions a healing of heart for all who participate, in any way, in abortion. Pray it daily." 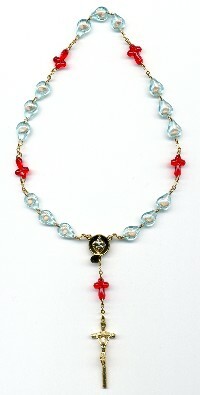 The Chaplet is packaged with free bi-fold prayer card that explains the Chaplet and how to pray it. contemplating abortion will have a change of heart." Our Lady Presents The Chaplet of the Unborn: Blessed Mother says: "Praise be to Jesus." "I have come with yet another important weapon in the fight against abortion. As you know, abortion is the one crime which, if conquered, would change the future of the world. The weapon I now hand off to you is the Chaplet of the Unborn." Blessed Mother holds out a chaplet with five sets of three Hail Marys and one Our Father - like the chaplet of the United Hearts. The beads are like the beads on the Rosary of the Unborn. She says: "Pray each set of one Our Father and three Hail Marys for the following intentions:"
"Set 1 - The recognition by all that God creates human life at the moment of conception." "Set 2 - An end to all legalized abortion." "Set 3 - For all expectant mothers - that they value the precious life within them." "Set 4 - The conviction of conscience in the Truth for anyone considering abortion." Those who, in their thoughts, words or lack of action, have supported abortion." "At the end, say the following prayer:"
"Heavenly Father, please forgive this generation for the arrogance of abortion. Heal the many wounds abortion has caused in our hearts, in the world and in our relationship with You. Unite us in the Truth. Amen."